Cisco Systems - Technical Support: Is it possible to avoid convergence during auth. EIGRP key rollover? 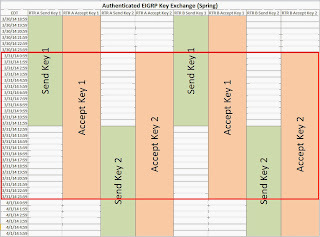 This configuration should provide accept overlap between key 1 and key 2 during the entire 24 hours of 31 March 2014. The send key rollover should happen at noon on 31 Mar 2014 (giving the router 12 hours of cushion for time variance). Unfortunately, during the rollover (forced by manually setting the router's clock ahead), I experience EIGRP convergence. This is unexpected because the router should accept both key 1 and key 2. Am I missing something? Is there any way to avoid convergence. 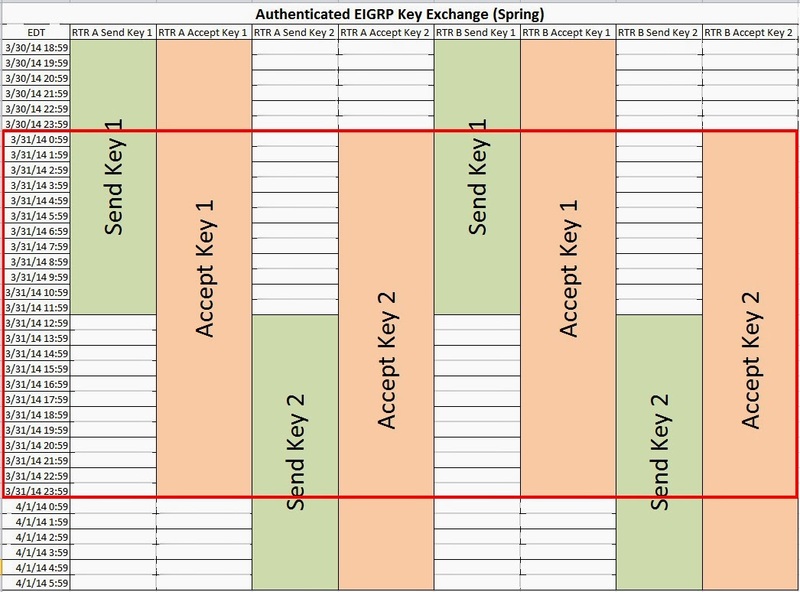 Please refer to the below image of the Authenticated EIGRP KEY Exchange. If any router would have to send HELLO packet between 11:59:59 and 12:00:00, there would be NO VALID KEY in that time. Maybe it is not your case and maybe it is kind of extreme, but it could happen. I wasn't really sure about this so I labbed it. R1 and R2 are interconnected through Serial1/0, IPs 10.0.0.1 and 10.0.0.2 respectively. Don't mind the time, they are out of sync but it really doesn't matter. So if R1 (or any other router) would hit the 1 second interval, it would sent out HELLO packet with no authentication at all which results in dropping the neighborship. Maybe that is what happened, maybe not. Just an idea. The thing is, as we already know by this point, the send-lifetime of the changing keys need to overlap a little so there wouldn't be a time period without a valid key. Update clocks with "clock set 23:58:00 30 mar 2014"
Verify all router clocks with "show clock"
Verify valid keys with "show key chain"
Update clocks with "clock set 11:58:00 31 mar 2014"
Update clocks with "clock set 23:58:00 31 mar 2014"